In the two years 2004/2005 the US experienced seven 'major' hurricanes. There have been zero in the nine years since then. Early signs indicate that 2015 will be another relatively quiet year. NASA’s Dr. Tim Hall discusses the upcoming hurricane season and uses his model to forecast 2015 activity in each state along the Atlantic coast. The US has not had a major hurricane landfall (Saffir-Simpson category 3 or higher) since Hurricane Wilma in 2005. In a paper about to be published, and previewed on InsuranceLinked in December, we estimated the current nine-year drought to be a 177-year event. We also estimated that the odds of a major landfall don’t depend on the drought length. But that’s long-term average. What can we say now, in April, about the particular upcoming season? While it is still early, our best estimate is that the probability of hurricanes making landfall along the eastern seaboard is 11% less than the long term average. In Texas, we estimate that current climatological conditions have reduced the probability by 22%. 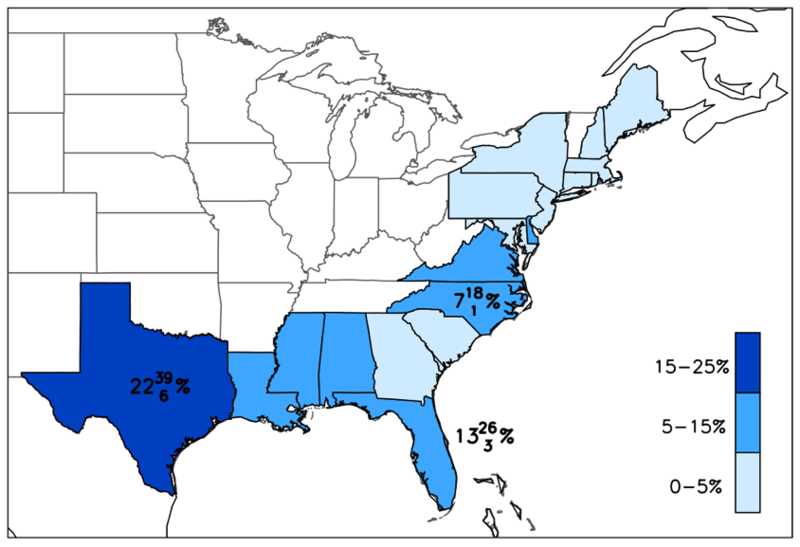 The map shows the percent change for US coastal states of 2015 hurricane landfall rate compared to the 1950-2012 mean using the average over the 25 ENSO forecasts. Every state shows decreased frequencies of hurricanes, though there is a significant variation in the size of the decrease. We also estimate uncertainties due to intrinsic randomness and to the spread of ENSO forecasts. Examples are shown for Texas, Florida, and North Carolina: Texas 22% (6%-39%), Florida 13% (3%-26%), and North Carolina 7% (1%-18%). Accumulated over all the coastal states, the reduction is 11% (2%-23%). Various climate factors influence hurricane activity, and some of these factors can be forecast with some skill months in advance. One of the most important is El Nino/Southern Oscillation (ENSO). A positive ENSO (El Nino) has more wind shear over the Atlantic, which inhibits storm formation. Columbia University’s IRI posts the ENSO forecasts of 25 models. There is a large spread of predictions for the next six months, but all models forecast either a neutral or positive ENSO state. Another factor is sea surface temperature (SST) in the subtropical North Atlantic SST compared to the global tropical mean (“relative” SST). High relative SST enhances hurricane activity, while low suppresses it. NOAA’s Earth System Research Laboratory currently forecasts near neutral relative SST for the 2015 season. If the ENSO and relative SST forecasts hold up, we should expect reduced hurricane activity, driven primarily by El Nino. The map was created by a model that generates large numbers of stochastic storms whose statistical properties match the historical storms. We drive the model multiple times with the ENSO and relative SST forecasts from April through December to generate many realizations of the 2015 season. Landfall rates are computed from the simulated hurricanes and compared to rates from a control case in which ENSO and relative SST are set equal to their 1950-2012 means. As ENSO forecasts and those of other covariates converge closer to the start of the season, the large US hurricane uncertainty will be reduced. Stay tuned. Dr Hall is a climate scientist at the NASA Goddard Institute for Space Studies in New York City. 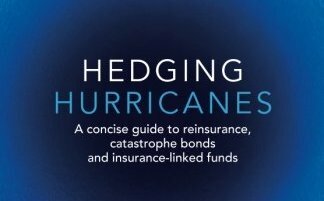 He specialises in hurricanes and their relationship to climate. He develops statistical hurricane and weather hazard models, and has worked as a consultant to RMS and reinsurance companies. Dr. Hall can be reached at timothy.m.hall@nasa.gov.